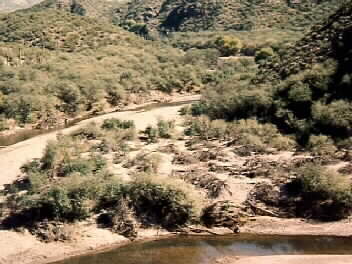 This junction of the Gila River with Dripping Springs Creek was where General Stephen Watts Kearny hoped to be given a new supply train of mules by the Pinal Apaches in November 1846. He was disappointed in that wish, and so he called the spot Disappointment Creek. In Apache it is called Nadah Cho' Das'án (mescal, big, resting). The Gila River is called Hagoteelé (river, broad) in Apache.